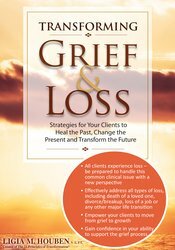 This powerful recording offers techniques and tools you can use right away to help your clients live a fulfilled life after loss. Despite being a heavy subject, Ligia Houben, grief and loss expert, presents it in a light manner. Ligia has put her life work into developing the 11 Principles of Transformation®, which is a unique system that will help your clients bounce back after a loss. She will walk you through each principle with case studies and client success stories of moving past grief to living a fulfilled life again. Ligia Houben, grief expert, will demonstrate tools that can help your clients find meaning, achieve breakthroughs, and to build the life they want on the other side of loss or transition. She will show you a roadmap that can help your clients find peace, healing and recovery. This recording will teach you how to help clients overcome their fears, live life with more meaning and purpose and transform from loss to living! This self-study program is designed to qualify for 6.25 continuing education hours. Nurses completing these self-study materials will earn 6.3 contact hours. Expires: 11/8/2021. Ohio Psychologist: PESI, Inc. is approved by the Ohio Psychological Association, Provider #263896894, to sponsor continuing education for psychologists. PESI, Inc. maintains responsibility for this program and its content. PESI is offering this self-study activity for 6.25 hours of continuing education credit.